This date stamp is ready to take on the busiest office. The sturdy steel frame construction stands up to heavy-duty use. 10 years of dates. 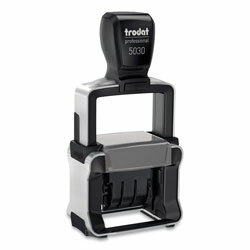 A self-inking stamp pad delivers rapid, repeat impressions. Stamp Type: Dater; Message(s): N\A; Years: 10. Traditional Stamps from U.S. Stamp & Sign! 720 In Stock today.